The essential points you have to remember to answer multiple choice questions on work, energy and power were discussed in the post dated 14th November 2008. Today we will discuss some multiple choice questions in this section. The kinetic energy of the doll (which serves as the bob of a simple pendulum) is converted into gravitational potential energy when the truck stops. In other words, the bob moves up doing work against the gravitational force, losing its kinetic energy and gaining an equivalent potential energy. ½ mv2 = mgh where m is the mas of the doll, v is the velocity of the truck and g is the acceleration due to gravity. Therefore, v = (2gh)1/2 . But h = ℓ – ℓ cosθ = ℓ(1– cosθ). 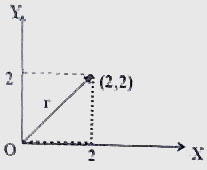 ½ mv2 = C t2 where m and v are the mass and velocity of the particle and C is the constant of proportionality. The velocity is thus directly proportional to the time t which means that the particle is in uniformly accelerated motion. The acceleration is therefore constant. This means that the force (F = ma) is constant and hence independent of time. [Option (e)]. The resultant force on the body is √(32 + 42) = 5 N.
Therefore, the kinetic energy of the body, K = ½ mv2 = ½ ×5 ×102 = 250 J. 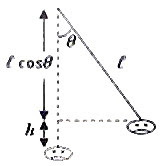 Since the collision at the floor is elastic, the ball bearing will return to the original level with the magnitude of its velocity unchanged, but the direction reversed. Therefore, the problem is equivalent to finding the velocity (v) with which the ball bearing is to be thrown vertically upwards to reach a height of 5 m.
[You can get the above relation by equating the initial kinetic energy to the gravitational potential energy at the maximum height h as ½ mv2 = mgh or from the equation of motion, 0 = v2 – 2gh]. We have U = ½ K×(0.02)2 = 0.0002 K where K is the spring constant. The kinetic energy is directly proportional to the square of the momentum (K = p2/2m), Therefore, when the percentage increase in the kinetic energy will be twice the percentage increase in the momentum [Option (c)]. [The fractional change in kinetic energy is given by DK/K = 2Dp/p which is twice the fractional change in momentum. The percentage change in kinetic energy is therefore twice the percentage change in the momentum]. But F = k/r where k is a constant. Thus the work done is proportional to the logarithm of displacement [Option (e)]. You may imagine the particle to be moved first along the positive x-direction from the origin O to the point (2, 0) and then along the positive y-direction from the the point (2, 0) to the point (2,2) as shown in the figure. The value of x changes from zero to 2 during the motion along the x-direction and the value of y changes from zero to 2 during the motion along the y-direction. W1 = 0∫2 Fx dx = 0∫2 (– 4x) dx = (– 4)×(22/2) = – 8 J.
W2 = 0∫2 Fy dy = 0∫2 (– 4y) dy = (– 4)×(22/2) = – 8 J. Therefore, total work done = – 16 J. In the next post we will discuss more questions in this section.